Pictured above is the Galena High School Girls Golf team, from left to right, Madeline Scott, Savanna Baker, Becca Baker, Lexi Miller and Chalice Sherer. 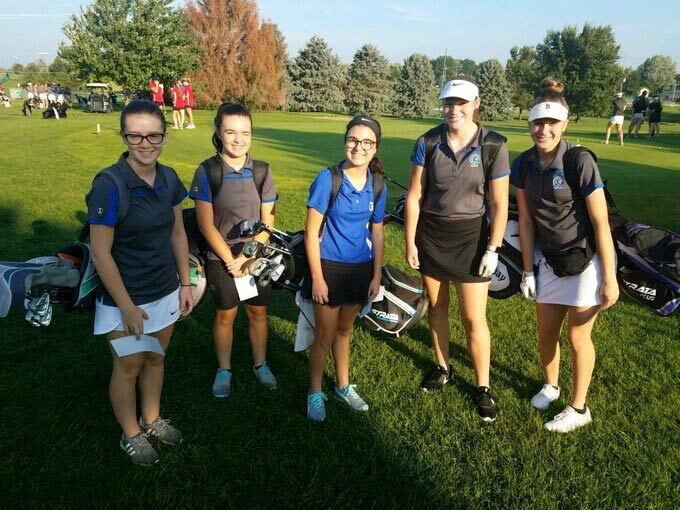 The inaugural season for the Galena High School Girls Golf team began on Monday, August 27, as the girls competed in the Springfield Catholic High School Invitational at the Bill and Payne Stewart Golf Course. The Lady Bears were led by sophomore Lexi Miller who finished the round with a score of 106. Juniors Becca Baker and Madeline Scott completed the course with scores of 111 and 113 respectively. Sophomore Chalice Sherer and Freshman Savanna Baker rounded out the team’s scoring. As a team the girls finished in 6th place out of a field of 11 schools. The second tournament for the Lady Bears was scheduled for Thursday, August 31st at Whispering Oaks Golf Course in Marshfield but was canceled due to inclement weather after only being able to complete four holes. The Lady Bears will next be in action on Wednesday, September 12th at the Buffalo Tournament. ​The girls team is currently comprised of 8 student-athletes and are one of only two schools in the SWCL to have a girls’ golf team.